K 2019, the trade fair for plastics and rubber, is fully booked. Over 3,000 exhibitors from more than 60 countries will occupy some 1.8 million sq. ft. of net exhibit space. More than 200,000 trade visitors from all over the world are expected to attend. The event, which takes place every three years, will be held Oct. 16-23 at the fairgrounds in Düsseldorf, Germany. The exhibitor database is available at online. At the end of March, online ticket sales launched with e-tickets that are less expensive than tickets purchased on site and include free use of all public transportation within the Rhine-Ruhr regional network of Düsseldorf to and from the trade fair. At K 2019, industry players will meet to demonstrate the sectors’ capabilities, discuss current trends and set the course for the future. K 2019 will address current challenges in the industry, especially regarding plastics for sustainable development and circular economy. A special exhibition, “Plastics Shape the Future,” will address packaging waste, marine litter and climate change as well as resource conservation, energy efficiency and recycling. The exhibition will be an international information and networking platform, and will involve politics and socially relevant groups with keynote speeches and speed talks. For more information, visit https://mdna.com/show/k or www.k-online.com/. For hotel and travel information, visit www.traveltradeint.com. 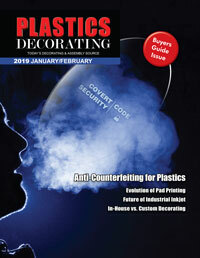 Read the latest print edition of Plastics Decorating on your desktop, smartphone or tablet. It is a free download at Apple’s Newsstand and Google Play.